For many years, I would walk into my Nonna’s kitchen and be greeted by the aroma of what I thought was the perfect tomato sauce. In most Italian American households, the ritual of the “Sunday Sauce” was a standard way to celebrate the weekend. But in my family, tomato sauce wasn’t just relegated to Sunday. It could show up any day of the week. My grandmother’s sauce was so good because of the painstaking work that went into it. When in season, she would clean, cook, and jar bushels and bushels of ripe Roma tomatoes from a local farmer. Those tomatoes would be the base of her sauce. She would make enough for a year’s supply. The work that went into was so physically grueling that most family members that she called on for help would not be able to keep up with her. Now that she’s been gone for awhile, and that fabulous sauce is no more, I’ve been trying my hand in the kitchen with my sauce pot, trying to recreate that magic. And you know what? Trying to be as good as my Nonna in the kitchen is a concept met with failure. Failure because I’ve been chasing that perfect tomato sauce from my youth, but it just won’t happen. Because there is no perfect. There is only good, or great (Photo: a recent pot of my creation). While chasing perfection, I’ve learned that excellence is attainable with some work, a little practice, and experimentation. 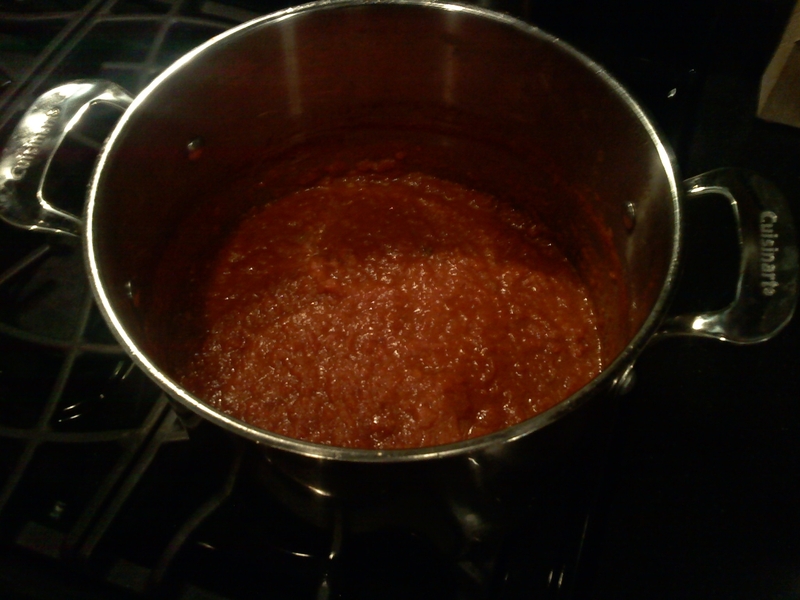 My first foray into the art of sauce making, as I remember, wasn’t very good. A little bland, too much acidity, not at all like the flavor I was trying to duplicate. But I kept trying. Taking different approaches. Instead of just cooking with olive oil, using a little butter as well. Peperoncino added to salt and black pepper. Then maybe some red wine in the next pot. A little sugar. With pork as a base, and without pork. You probably get the drift. I was trying to find my sweet spot. The key is the tomato. While I haven’t tackled my Nonna’s work of turning farm fresh tomatoes into shelves of goodness filled jars in my cellar, I use the best tomatoes I can find. I’ve tried many brands along the road to find what I like, and the San Marzano tomato is superior to all others. The Cento brand is the best. Yes, they are twice the price of your standard canned tomato, but that’s OK. This is one area where I refuse to skimp. And it’s worth it. While I can’t duplicate the aroma and taste of the sauce that used to simmer on my Nonna’s stove, I come damn close. Life is a lot like my tomato sauce . It will never be perfect. The more you search for perfection, the less likely you are to find it. This will make you unhappy. There will always be something bigger, better, faster, more expensive, and maybe…tastier…than what you have. This doesn’t matter. Don’t even pay it attention. Forget about being perfect. Try to be really good, even excellent, in what you like to do. Give it your best shot. Keep trying. If your “sauce” isn’t good the first time – try it again. Keep “cooking”…with just your effort, that sauce eventually becomes tasty. Life is good with small, everyday things that you love…like tomato sauce. Nonna always said “Life is precious”. Take that to heart. Don’t waste it chasing “perfect”. Ah, we are channeling Lombardi- Chasing excellence. It is a noble pursuit and one worth chasing. Very well said Joe! Striving for perfect keeps us from seeing just how GREAT what we have and what we are working on already is. There is much to be learned through acceptance and contentment. Keya, thanks for your comment. I do appreciate it. But that’s me and I’m talking canned tomatoes 😉 You’re talking about rituals and a true labor of love in an Italian-American kitchen. I can smell that sauce cooking. Love the story (a great way to pay tribute to your family) … and the lesson.